The pictures flash up on a screen on an upper floor of the Fallujah General Hospital. And all at once, Nadhem Shokr al-Hadidi’s administration office becomes a little chamber of horrors. A baby with a hugely deformed mouth. A child with a defect of the spinal cord, material from the spine outside the body. A baby with a terrible, vast Cyclopean eye. Another baby with only half a head, stillborn like the rest, date of birth 17 June, 2009. Yet another picture flicks onto the screen: date of birth 6 July 2009, it shows a tiny child with half a right arm, no left leg, no genitalia. “We see this all the time now,” Al-Hadidi says, and a female doctor walks into the room and glances at the screen. She has delivered some of these still-born children. “I’ve never seen anything as bad as this in all my service,” she says quietly. Al-Hadidi takes phone calls, greets visitors to his office, offers tea and biscuits to us while this ghastly picture show unfolds on the screen. I asked to see these photographs, to ensure that the stillborn children, the deformities, were real. There’s always a reader or a viewer who will mutter the word “propaganda” under their breath. “I have been to see the ministry,” she says. “They said they would have a committee. I went to the committee. And they have done nothing. I just can’t get them to respond.” Then, 24 hours later, the same woman sends a message to a friend of mine, another Iraqi doctor, asking me not to use her name. The photographs continue on the screen. January 19, 2010: a baby with tiny limbs, stillborn. A baby born on 30 October, 2010, with a cleft lip and cleft palette, still alive, a hole in the heart, a defect in its face, in need of echocardiography treatment. “A cleft lip and palate are common congenital anomalies,” Dr Samira Allani says quietly. “But it’s the increased frequency that is alarming.” Dr Allani has documented a research paper into “the increased prevalence of birth defects” in Fallujah, a study of four fathers “with two lineages of progeny”. Congenital heart defects, the paper says, reached “unprecedented numbers” in 2010. Dr Allani’s computer files contain a hundred Zeids. She asks another doctor to call some parents. Will they talk to a journalist? “They want to know what happened to their children,” she says. “They deserve an answer.” She is right. But neither the Iraqi authorities, nor the Americans, nor the British – who were peripherally involved in the second battle of Fallujah and lost four men – nor any major NGO, appears willing or able to help. When doctors can obtain funding for an investigation, they sometimes turn to organisations which clearly have their own political predetermination. Dr Allani’s paper, for example, acknowledges funding from the “Kuala Lumpur Foundation to Criminalise War” – hardly a group seeking to exonerate the use of US weaponry in Fallujah. This, too, I fear, is part of the tragedy of Fallujah. Dr Chris Busby, a visiting professor at the University of Ulster who has surveyed almost 5,000 people in Fallujah, agrees it is impossible to be specific about the cause of birth defects as well as cancers. “Some very major mutagenic exposure must have occurred in 2004 when the attacks happened,” he wrote two years ago. Dr Busby’s report, compiled with Malak Hamdan and Entesar Ariabi, says that infant mortality in Fallujah was found in 80 out of every 1,000 births, compared to 19 in Egypt, 17 in Jordan and only 9.7 in Kuwait. Another of the Fallujah doctors tells me that the only UK assistance they have received comes from Dr Kypros Nicolaides, the head of Foetal Medicine at King’s College Hospital. 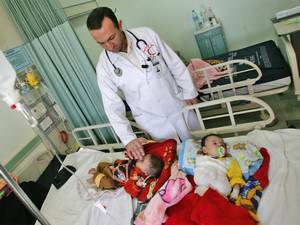 He runs a charity, the Foetal Medicine Foundation, which has already trained one doctor from Fallujah. I call him up. He is bursting with anger. “To me, the criminal aspect of all this – during the war – was that the British and the American governments could not go to Woolworths and buy some computers to even document the deaths in Iraq. So we have a Lancet publication that estimates 600,000 deaths in the war. Yet the occupying power did not have the decency to have a computer worth only £500 that would enable them to say “this body was brought in today and this was its name”. In al-Hadidi’s office, there are now photographs which defy words. How can you even begin to describe a dead baby with just one leg and a head four times the size of its body?